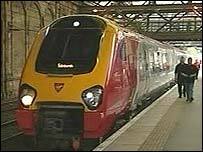 "There are worries the failure of Virgin's extended franchise bid could mean the end of CrossCountry," says John Bourn, North East spokesman for the pressure group Transport 2000. The Strategic Rail Authority (SRA), which awards rail franchises, ruled this month that Virgin's tender to operate one of the UK's main rail arteries until 2012 was "significantly too high". "We were in negotiations with Virgin for 18 months, and they came back to us three times with different proposals, " Jonti Alone at the Strategic Rail Authority tells BBC News Online. "We turned it down on value for money reasons." So far, Virgin has been allowed to continue operations on a year-by-year basis. But the SRA warned it "reserved its right to terminate the franchise". The SRA now has to decide whether to put the franchise out to open competition. If it was to decide to do so, Virgin would be given at least 12 months' "notice of termination" and bids would be invited. "Opening up the franchise to tender may be the best way forward," an SRA spokesman says, stressing that the authority is keeping "all options available". "We have heard that the CrossCountry route may be changed," says Virgin Trains' David Ewart, insisting that "there is no need for a change and [we] have been arguing that point very strongly". "This is a national integrated network which we have helped to build up," he says, insisting that Virgin has transformed the franchise since 1997 by replacing elderly rolling stock with 125mph trains at a cost of £390m and increasing passenger numbers by 40%. "The next move comes from the SRA." The SRA has denied its rejection of Virgin's proposals is part of a grand plan to abolish the franchise. "The SRA is vehemently against any break-up of the route and our decision not to renew the Virgin franchise has not been Treasury driven," a spokesman insists. 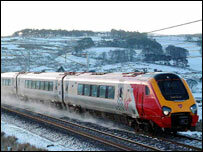 Franchise is 51% owned by Virgin/49% by Stagecoach. Yet the uncertainty caused by the SRA decision has, along with government plans to wind up the agency sometime next year, stirred up fears among industry watchers who worry about the long-term future of the franchise. Many believe the government would like to see the franchise axed and the route broken up and shared among several existing regional operators. "Powerful figures in the Treasury are arguing for it to be dismantled," says Mr Bourn. "It is a question of whether the SRA can take a decision on the franchise in the next 12 months - before the organisation is wound up - or whether the Department for Transport, or some other government agency, makes a final decision some time down the line. "It is in the interest of passengers to see some decision taken shortly, so as to avoid damaging uncertainty over the future of the service." The Department for Transport declines to say whether CrossCountry has a secure future, or whether the route and rolling stock, including new Voyager trains, will be shared out among other operators. "The SRA has made an initial decision, on a financial basis, about Virgin's contract," says a spokesman. "We are not in a position to speculate about what the future options will be, of which there are several." If broken up, the government would save on subsidies; it paid the service £246m last year. Other savings, such as on maintenance depots, may also be possible. But critics insist that in the long run, such short-term cost cuttings could prove detrimental. "Scrapping the route might save money for the taxpayer, but rail services would be diminished," says Peter Lawrence, president of the pressure group Rail Future. If broken up, other operators which own track sections, such as GNER, First Group, and Central Trains, could take over the running of services on different parts of the route. This would be "disastrous" for passengers, with a "great number of existing through-journeys being broken up," said Mr Bourn. It could mean passengers having to change trains - at Bristol, Birmingham or Leeds, or possibly all three - to travel diagonally from one corner of the UK to the other. "There have been long-existing cross-country services in the UK for many years, and there is always likely to remain a need for them," Mr Bourn says.